Love this image cos its so different, i think they will love it! Michelle, what an adorable wedding card. I always love black and white together...it is very striking. Your image is soo cute! Nice to have you join us again this week. Your image is so fun. Love everything about your card. Great take on the sketch. Thanks for playing along @SSW!!! WOW Michelle! It's awesome! Such a brilliant twist on a wedding card. I love it! Thanks for playing at SSW! 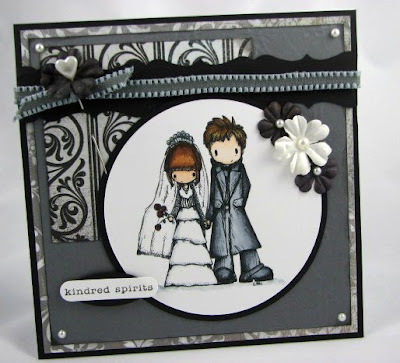 Michelle, I'm sure they will love this wedding card...It is a little untraditional but I do love the bride! Your papers are perfect. I always love black and white. Thanks for playing at SSW! I LOVE this card!! The goth images at Tiddly Inks are just fab! Your friends will love it. Also liked your father's day card but hadn't got a chance to comment. Great cards!! I absolutely love this! Awesome, awesome, awesome! Oh they will love it! Just a bit on the dark-ish side - wonderful!!! Thanks so much for playing at SSW.